The recent fishing on Esthwaite has been a bit tricky over the last few days with cold air temperatures and heavy rain putting the fish down, however before the unsettled weather arrived the fishing, especially top of the water fishing was out of this world. We have experienced excellent hatches of buzzers, olives, damsels, sedges and alders. With falls of daddies and hawthorns thrown in to the equation, providing a myriad of fly life and the conundrum as to which fly to choose. When conditions have been right the top of the water and dry fly fishing have been absolutely fantastic. Two anglers that really had a day to remember on the dries were Mike Laycock and Bob Swann who fished from the boats and took 30+ fish to 4lb + on a variety of methods, however the bulk of their haul were taken on dries such as daddies, hoppers, cdc’s and buzzers. [ see attached picture of Mike Laycock with an over wintered fish of 4lb 1oz ]. Ernie Craster and Kevin Henderson from Stockton also had a great day from the boats landing 15 fish to 3lb+ on floating and intermediate lines and blob combinations. Venue regular and season ticket holder Jim Miller took 34 brown’s and rainbows to 3lb+ in two visits,on cats hisker, diawl bachs and damsels. All Jim’s fish were taken from the boats! Also another season ticket angler that has been getting in on the action was Bill Mckenna who also boat fished and had 10 fish to 2lb+. Bill’s fish were all taken on a variety of lures from the boats. Hawkshead Angling Club member Sean Whitaker fished for 4 days from the boats to take 31 fish on a variety of flies, including cats whiskers, hares ears and diawl bachs. Meanwhile Peter Lang took 10 browns and rainbows to 3lb+ on worm and spinning tactics from the banking opposite the ticket office! The 2011 Esthwaite Water Tackle Shop Challenge took place last week and the competition was won by Dave Hunt and Scott Graham from Northwest Angling Centre who weighed in a brace of rainbows for 3lb 8oz. Well done lads! Also heat 3 of the Esthwaite Water 2011 Open Pairs competition was won by Jim Tuck and Graeme Bell who weighed in under tough conditions, two rainbows for 3lb 9oz. Also qualifying for the final in September were John Henderson and Tom Nelson weighing in 1 rainbow for 1lb 50z. Well done to both of these pairs who prevailed on the day and despite the hard fishing conditions. We still have places left on our discounted tuition days. The June 4th day is now fully booked, however we still have places left for the 12th June, 25th June and the 19th July. Please ring 015394 36541 for further details. 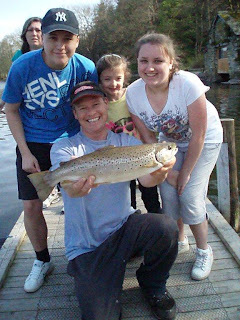 Also Hawkshead Angling Club still have a few places left for the 2011 season. This club is affiliated with Esthwaite Water and membership is restricted to 100 adult members and unlimited on the juniors. There is now NO geographical boundary, so anyone can join. The cost is £135 for adults and £31 for juniors. For further details contact the secretary Emma Macintosh on 015394 36116 or email alex@garishglobes.co.uk. The fishing over the Easter period here at Esthwaite has been fantastic, the lake has really burst into life now. Water clarity is excellent, despite the good run of sunny weather experienced over the last couple of weeks. Even though we had bright weather the fish remained up in the water and given the right conditions buzzer , olive and alder hatches have been extensive. Hawthorn flies have also been common place also, but the best top of the water fishing has been experienced at either end of the day, when light levels have been lower. During the day, best tactics have been to use floating, intermediate or slow sink lines, in conjunction with nymphs and buzzers. Damsels, hares ears, diawl bachs and crunchers have all featured well on the catch returns! With lures such as cats whisker, sparklers and boobies also doing well on the sinking line tactics. Esthwaite Peregrine member Jon Turner had a cracking day from the boats, landing 14 browns and rainbows, with the majority of fish falling to black booby and olive cormorants! Meanwhile Alan Hutchinson and David Wilding from North Wales also experienced great sport, taking13 fish between them to 3lb 8oz from the boats on sinking line and straggler cats. Ron Thompson from Bristol also had a day to remember on the boats, taking 15 fish on diawl bachs and damsel nymphs, fished in conjunction with an intermediate line! Season ticket anglers have also been latching into good numbers of fish with Jim Miller from Keswick taking 5 fish from the boats and John Gardner and Richard Maddox taking 33 fish over 3 days on a range of flies including buzzers, gold head nymphs and cats whisker lures fished from the boats. Richard took the best rainbow in the form of a cracking over wintered specimen of 4lb+. John however took the best brownie estimated to be in the 4-5lb bracket. Johns fish was released to fight another day! Any method anglers have also been experiencing fantastic sport, indeed H.A.C member Shaun Hunter fished from the boats to record a 20 fish haul on float fished worm! The area just outside the ticket office has also been providing excellent sport for the kids over the Easter break. 9 year old Chloe Jacks and 6 year old Mia Jacks took 7 trout between them on legered worm. Meanwhile 16 year old Josh Allis from Melton Mowbary took a fine Brown Trout off the boat jetty on worm [ see attached picture ]. Hawkshead Anglers are still recruiting for the 2011 season. Telephone Emma Macintosh on 015394 36116, however be sure to be quick as membership for the club is restricted to 100 adult members. Remember there is now NO geographical boundary for the eligibility for the club, so now you don’t have to be a local! There are also boats still available for the third heat of the Masterline Walker and Pure Fishing sponsored Esthwaite 2011 Open Pairs competition, Please contact the fishery for more details and entry forms. The heat takes place on Saturday 14th May. For up to the minute information log onto http://www.hawksheadtrout.com/ or telephone on 015394 36541.